I was supposed to shoot Sun-Dresses and Swimsuits today. Facebook failed to pass me the message that one was sick, and the other had said she wasn’t sure she could. So after waiting downtown for 45 minutes, I got there early, I went for a walk and ended up on top of the old Eaton’s Parkade on Gordon St. So far I’ve edited two images. 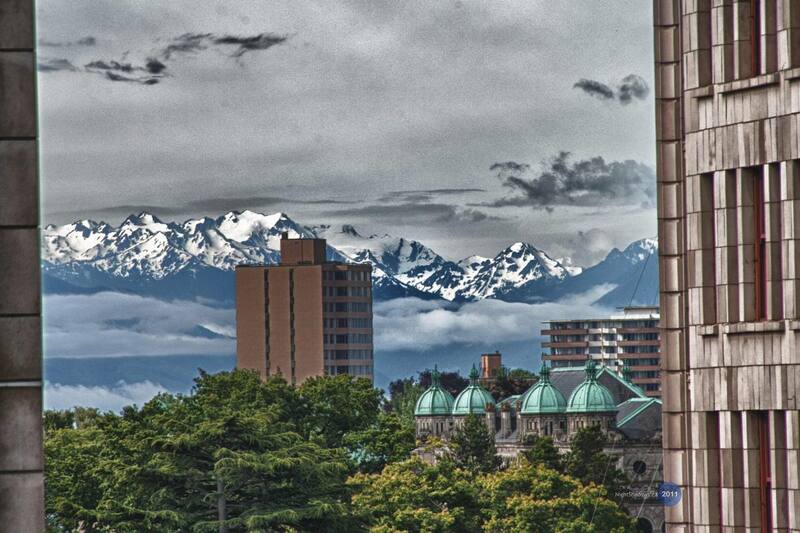 The first image was a look south between buildings at the Olympic Mountains. To the right is the Magnolia Hotel. The green domes in the lower right are the east side of the BC Legislative Building. I believe the Peak above the Legislative Building is Mt. Pleasant, about 45 miles away. The second image is from the opposite side of the parkade. I looked out on to Broad St, towards the Bay Centre and realized the perfect opportunity for a tilt-shift image. A tilt-shift image uses depth-of-field focus to causes a scene to look like a miniatures diorama. See how the cars appear to be toys, and the buildings look like models.